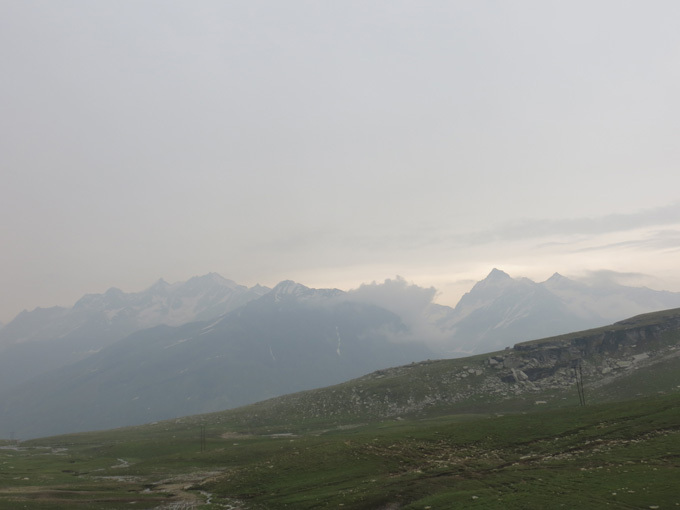 Our 2nd day in Manali started off early on a rainy morning as we got ready to head to Rohtang Pass. 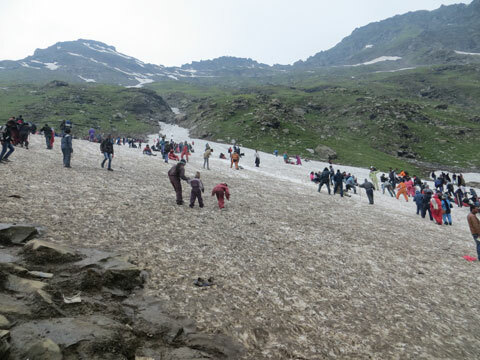 I should say, if you happen to come to Manali for holidaying, it is very unlikely that you do not plan a day’s trip to Rohtang Pass. It is a must-visit place for nature lovers (if you excuse the large number of tourists you experience there) as well as adventure seekers. 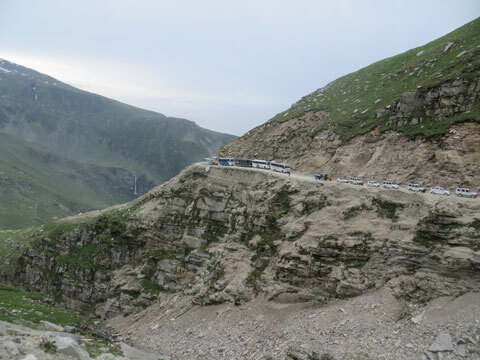 The invincible Pass falls on NH 21, on the Manali-Keylong-Leh Highway. 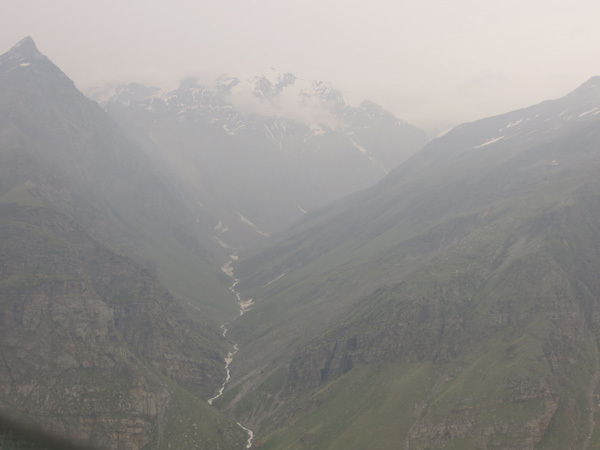 Beyond Rohtang lies the twin valley of Lahaul and Spiti. The Highway however remains closed from November till late March or early April because of heavy snowfall. This year the Highway has already been blocked since November 15th, 2016 and is set to open for public after April 2017, after the snow clearance operations get over. 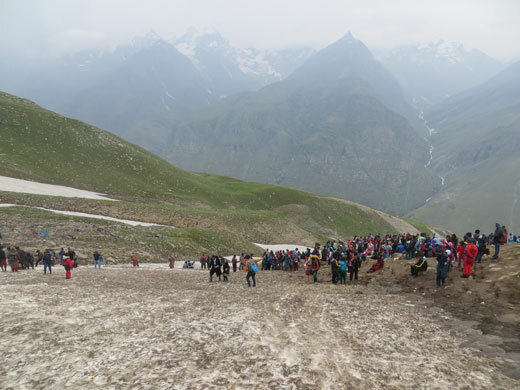 Since Rohtang Pass remains closed on Tuesdays for maintenance work on the Highway, we planned our trip to Rohtang in a way that it does not fall on a Tuesday. 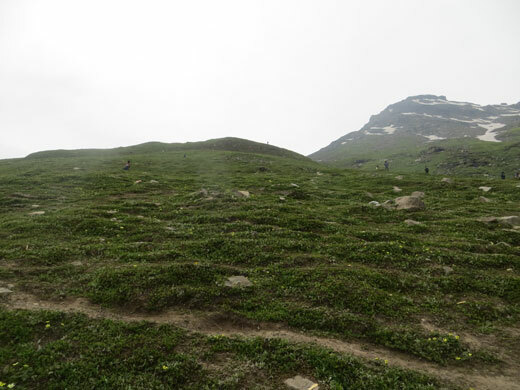 The distance from Manali to Rohtang is around 51 kms and it is always recommendable to start early to avoid heavy congestion on the road leading to the Pass. We having started early in the morning (around 5.30 AM), the hotel in which we stayed packed our breakfast for us to have on the way. You will however come across food shanties and dhabas on the road, if not at short intervals that sell water and other eatables and so even if you are not carrying anything with you to eat, you need not worry. We had booked our cab a day earlier through our hotel. Local taxis otherwise can be booked from the Mall Road in Manali where a number of tour operators have set up shops, and who already have a permit ready to take tourists up to the Pass. You can either book a full vehicle or a shared cab. The rains thankfully had stopped by the time we started on our journey. As we drove away from Manali, we came across several shops and shanties putting up on rent dungarees, boots, warm overcoats, gloves and other warm clothes required to wear at Rohtang for both men and women and even children. Our driver stopped at one of his known shops and urged us to hire some warm clothes, which was costing us Rs 200 per dungaree. When we did not take any, he kept on saying that it would be very cold and we will find it hard to bear. We however believed that there would be no snow at this time of the year. And we were so true! 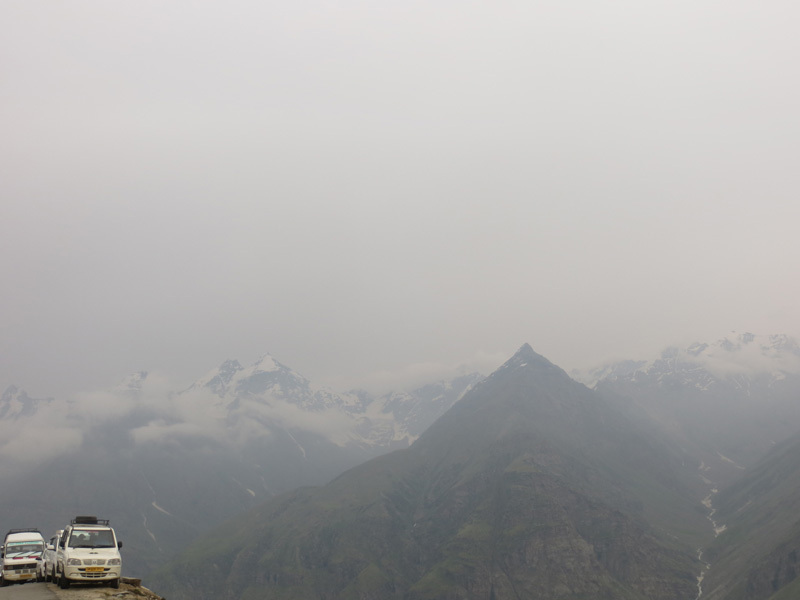 Since it was in the month of July that we visited Manali, the snow had already started melting; but I really enjoyed the scenic drive up to Rohtang. The views were so breathtakingly beautiful that one would get easily enchanted and transported to a world of fantasy and beauty. The sharp curves and the rough terrain would at times frighten the life out of any faint hearted person, but the thrill of driving amidst the giant elevated peaks and the hovering thick clouds is just overwhelming. Luckily we did not get any traffic while going uphill to Rohtang but we did get stuck in one while coming down near a place called Rani Nullah. The traffic gets so worse at times that it takes hours to clear. 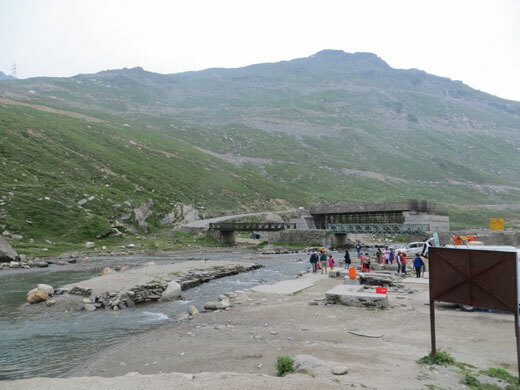 We came across several tourist attractions on our way – Nehru Kund, Gulaba, Marhi, Rahla Falls but we did not stop at any of these places since we were in a hurry to reach Rohtang before the tourists started coming. 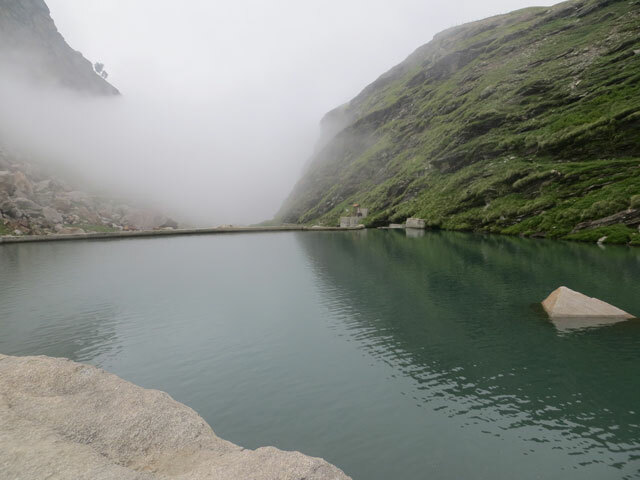 Nehru Kund is a natural spring from where it is said that Jawaharlal Nehru once drank water from and hence the name. According to local beliefs, the water has medicinal effect too. 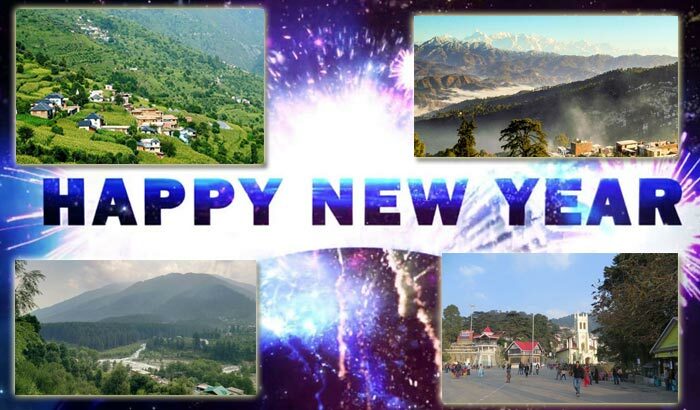 Gulaba is a famous picnic spot and because of its serene and beautiful surroundings, many consider it to be a better alternative for a quiet holiday than Manali. The checkpost for obtaining permits and for paying the congestion charges to go up to Rohtang Pass is also located here. Rahla waterfalls is about 50 mts and is said to be one of the branches of the Beas River. Kothi is again a place known for its scenic beauty and is supposed to be the first village on the banks of the river Beas. 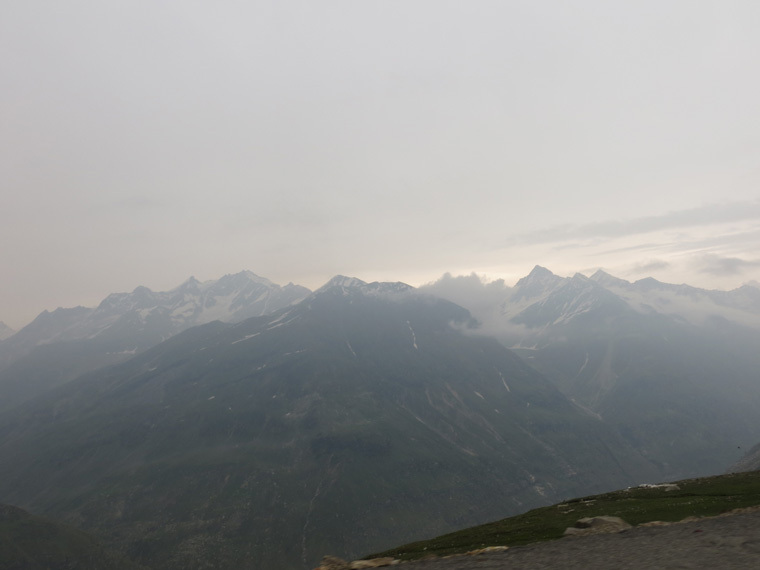 We reached the snow point (the main point at Rohtang Pass) in about 2 hours. A whole crowd of tourists had already gathered there with private cars and local taxis lined up from a distance. 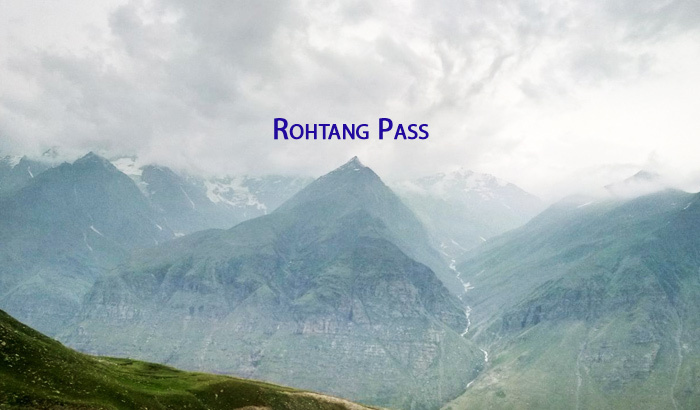 If not for the maddening crowd that takes away all the fun of being in such a beautiful place, Rohtang Pass presents a beautiful escapade amidst snow-capped mountains and peaks. Located along the Pir Panjal range, the spectacular view of the high tall peaks had left me spellbound for a moment. I wondered how it would be during winters when this whole place turns into an ice glacier. 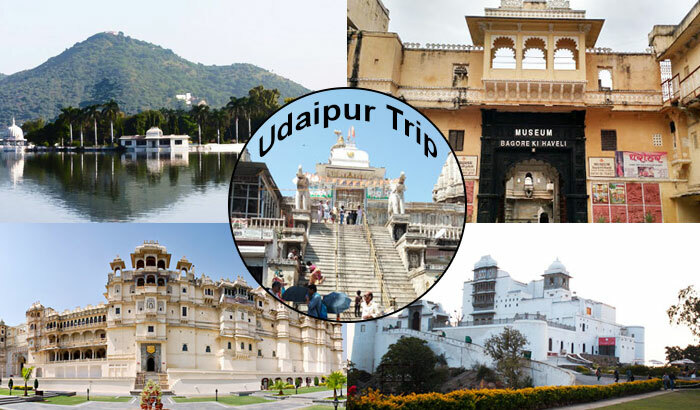 No wonder then that this place attracts more than 2 lakhs visitors every year. It was mostly slush (muddy snow) at that time that was quite deep and very slippery at certain places. We avoided those stretches as we had not put on boots, though people were enjoying walking and sliding down those slushy slopes. We spent more than an hour at the Point and started on our homeward journey. 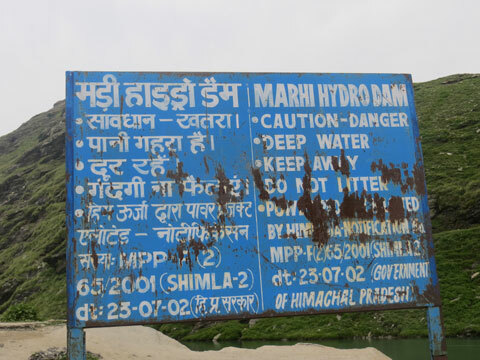 While coming back from Rohtang, we stopped at Marhi when we sighted a hydro dam beside the road. It is a beautiful place surrounded by green meadows with the Beas river flowing beside it. As we drove downhill, past the beautiful landscapes, I looked back to have a glance again at the majestic mountains behind. It has indeed been a surreal experience, to have come so close to nature. I longed to be in such a place again and enjoy the same grandness of the pristine hills that I had just experienced. 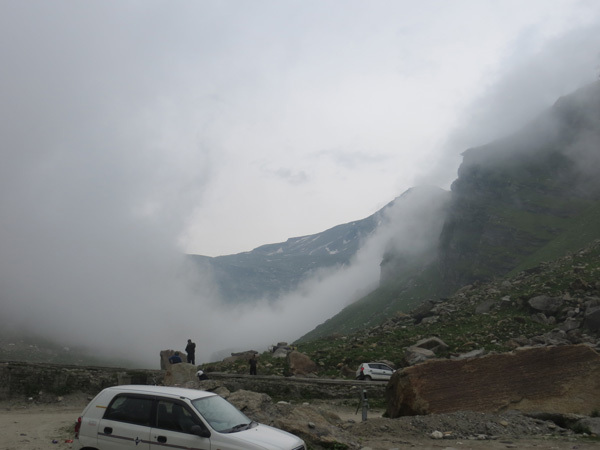 Share the post "Rohtang Pass – The Paradise of Mystical Wonder"